Here's a cardmaking technique : Finger Printings by Barbara Phelps from the United States. A simple technique that when used rightly gives great results. Well, if you have enjoyed Barbara's other cards on the previous four pages, then I'm sure you will love these two lovely finger printed creations by her. Two winsome cards! I'm sure anyone will love receiving these two beauties. Light lilac flowers looking so whimsical against white colour card-stock. The hand drawn green stalks and leaves complete this beautiful picture of flowers swaying in the breeze. Barbara said that she used her fingers to create these cards. I will let her tell you in her own words. Barbara : I am sending, Flora... two cards, which are very similar, and employ the same technique, in two separate scans. This first one's very light purple flowers; the second, pink flowers. 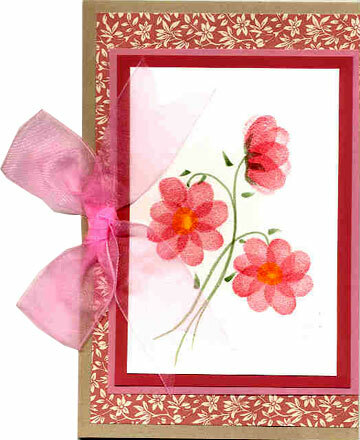 What's a bit different about the image on the cards is that neither floral image was created by using a rubber stamp. What I did was employ a "stamp" that has been attached to the end of my arm since I was born...my index finger. I pressed my index finger into dye ink and then pressed the inked finger onto cardstock. 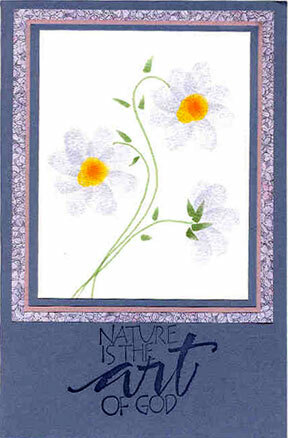 I even pressed my finger into yellow dye ink to create the flowers' centers. For the stems and leaves I simply freehand drew them with a marker. Thank you so much for sharing this technique with us. What do you think? You who are reading this page and viewing these two cards, what do you think? Are you like me all ready to get your index finger dirty. You know you can always go shampoo your hair after that because that's how I usually clean my fingers after a day of card-making. Cards 2 - Three beautiful handmade cards. A Happy Anniversary card, a black and white card with an image of a lion, and a stamped image of a cluster of grapes layered on colour card-stocks. Cards 3 - Three beauties indeed! Dragonfly Tags On A Card/Faux Cross-Stitched Card/Vintage Style Photo Card. (Check out how Barbara created a faux cross stitch effect as well as incorporating tags and photo into her creations.) So creative! Cards 4 - Three cards three techniques used. Stamping on glue, tissue technique and weaving technique. Cards 6 - Must view! Six rubber stamped cards using Gibson Girl image, a stamp of horses, Oriental bamboo and more. Barbara explained the various methods and supplies she used to create these hand-stamped cards.